GREEN 650 / 5L and GREEN 1000 / 6L are absolutely the best-selling potato digger-harvesters of the range. Both of them arise from the need to provide a suitable mechanization for product harvesting even when this is not fully mature. This innovative design machine with small dimensions but with large work areas offers high performance. The levers operated by the tractor driver control the collector belt, the shift of the drawbar, the wheels and the rear 600 Kg. bin elevator. High maneuverability from the pump directly connected to the Pto of the tractor (without cardan), the displacement of the drawbar and the wheels. Two hydraulic valves placed on the operator’s side control the rotation speed of the collector belt and the large sorting belt; constant supply to the sorting belt and ease of work to be done. Two platforms placed at the sides of the sorting belt comfortably host four operators, but there is room for another two. The elevator carries a max. 500 Kg. bin which is discharged in line with the machine, or there is a platform for bags and / or crates filling. Optional: Front unit for onions harvesting (to replace the potato unit). 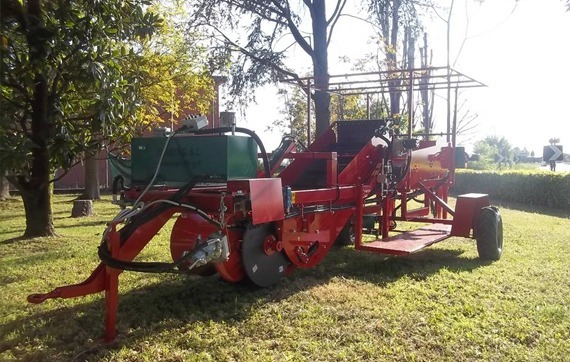 Simple but robust agricultural machines, helpful and skilled personnel, a professional company at customer service: these are the features that make Carlotti G. & C. one of the best Italian companies.